It’s all change for the Swift Challenger range’s 2016 season. The Sport and SE have been dropped, and the new Challenger is just that; Challenger. However, Swift is keen to point out that there is the option of upgrading any of the 2016 Challengers to having Alde heating rather than the standard Truma system at the time of ordering. A really smart body adorns the new Challenger, which is built using Swift’s SMART Plus construction techniques. A GRP skin protects the underside of the floor, whilst the fully-bonded roof has been upgraded and is made from hailstone-resistant GRP with polystyrene insulation. At the rear, bars allowing the attachment of a Thule cycle rack are fitted. 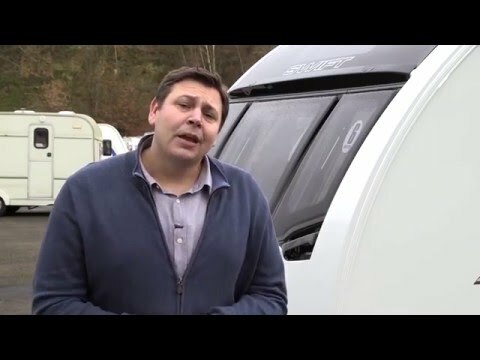 Here we review one of the larger family models, the six-berth Swift Challenger 590. And to see other Swift caravans for sale, click here. The new front and rear panels of the Challenger are really striking, with the rear including LED light clusters borrowed from the Elegance. It runs on an Al-Ko chassis which is fitted with an AKS 3004 stabiliser and lightweight corner steadies (all of which are easy to access), but sadly, the ATC stability control remains an option for 2016. Look a bit closer, and you’ll see that things like an external barbecue point and external mains sockets aren’t included. Neither is there any nearside under-bunk access. There is access to under the bottom bunk at the rear offside, though. The main electrical controls are located above the entrance door for easy access. All of the other essential services are sensibly placed on the offside of the caravan. There are two lounge areas in the Swift Challenger 590. Starting at the front, it’s the usual parallel sofa arrangement – and it is large enough to seat a family of six (just). Thanks to there being plenty of windows, a sunroof, a midi-Heki and light coloured fabrics, there’s certainly a spacious feel in here. The clinical colours of the fabrics are lifted with the inclusion of duck-egg coloured scatter cushions and accents in the curtains. And when it’s dark outside, there’s plenty of LED artificial lighting to keep things well lit. Moving to the rear, there’s room for three to sit at the side mounted table. A small cupboard on the rear wall contains hidden TV connections. Without doubt, this lounge is aimed at offspring. But, once again, it has a light and airy feel. Very well equipped, but not particularly spacious sums up the 590's kitchen. Work surface wise, a removable drainer and a fold-up extension do help. In terms of equipment, there’s a Thetford Aspire MkII cooker, with a dual-fuel hob and separate oven and grill. A 110-litre Dometic fridge sits forward of a narrow cupboard (which has pull-out baskets) and cutlery drawer. The microwave is located at a fairly high 1.54m from the floor, but is at least above the sink and not the cooker, so you’ll not be reaching over hot pans or boiling water to access it. It's also good to see a couple of mains sockets, plus a pop-up rooflight to keep things ventilated. Kitchen storage is reasonable, with a couple of large overhead lockers and a pan cupboard under the cooker. Considering that the washroom is often a major compromise in this layout, Swift has done a brilliant job of cramming as much as possible into the small space without it feeling cramped. There’s a separate shower cubicle (fully lined) with an Ecocamel Orbit showerhead, and a useful on/off switch to help preserve water. You'll also see a good-sized sink, together with a couple of cupboards to store usual washroom knick-knacks, and a Thetford electric flush toilet. Although the washroom hasn’t got a window, there is a pop-up rooflight. With a full six people on board, it’s likely the 590 will be used mainly on full-facility campsites, but with fewer occupants there’s no reason why this washroom couldn’t be used on CL/CS type sites. The beds at the front consist of either a pair of singles (although they’re not the longest at 1.86m on the nearside, and especially at 1.76m on the offside), or a good sized double (which measures 2.02m x 1.36m). Whatever arrangement is used, turning the seat bases around for comfort would be needed, but each occupant gets his or her own reading light. Moving to the rear of the Swift Challenger 590 (which is what this caravan’s about) there’s a pair of fixed-bunks on the offside, both of which are a decent 1.81m long. Each bunk has its own small window and a reading light that’s easy for youngsters to operate as the light only needs to be touched to make it work. Of course they’re 'cool-to-the-touch' LEDs. On the nearside, the dinette transforms into another pair of bunks. The lower bunk bed is 1.78m x 0.62m, while the upper is 1.69m x 0.59m. A concertina curtain divides the area from the rest of the van. There should be adequate storage for a family in this caravan. There are eight overhead lockers (not including those in the kitchen), and three of those in the rear lounge are shelved. And whilst the wardrobe is fairly modest, it should be big enough for family use, although it's worth noting that the main table is stored here, too. The space under the front nearside bunk, the rear seat bases and under the bottom fixed bunk are all completely free of any obstructions, and as it’s probable that any bedding on the fixed bunks will remain in situ, there should be more than enough space to cater for a family’s needs. You can then add to the list the drawers in the front chest and the storage in the washroom. So, come the end of our Swift Challenger 590 review, what's the verdict? With a 7.54m shipping length, this is a large caravan. But even with the optional Alde heating system fitted, it still comes in with a manageable all up weight (it has an MTPLM of 1565kg as standard, this rising to 1586kg with the Alde heating). Therefore this tourer is likely to be within the capabilities of many tow cars that have sufficient space for six occupants. Having a caravan that copes with six is always going to be a compromise, but despite this, Swift has done a good job with the Challenger 590 which has two distinct lounge areas, both of which are pretty spacious. The only slightly cramped area is perhaps between the kitchen and the washroom. Although marketed as a six-berth, we think that this layout will particularly appeal to families of four, where children have their own area and can enjoy those fixed bunks.